Create a Period & Fertility Cycle Calendar in Word or Excel. 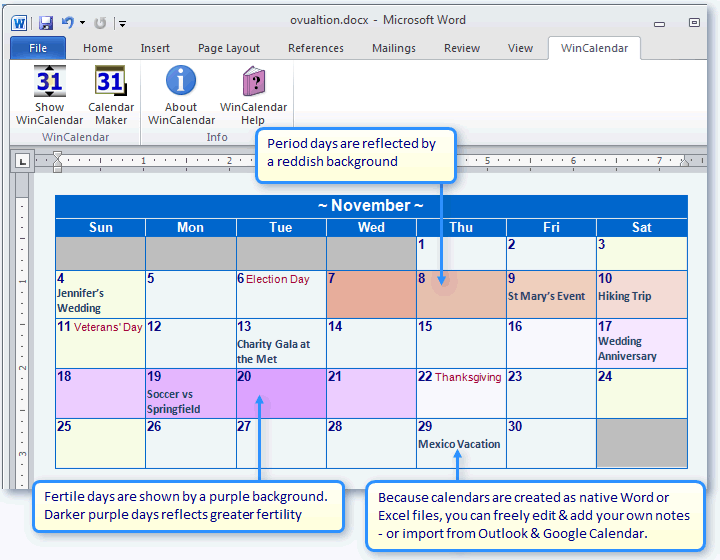 With WinCalendar you can create a fully editable Fertility Ovulation & Period* calendar in both Microsoft Word & Excel. Above is one of many supported layouts. Other layouts that support a calculated Fertility/Period calendar include: Weekly Calendar, Schedule, and Agenda. WinCalendar is customizable and supports many options for Period & Fertility calendars. The calendars are created as native Word or Excel format. You can further edit and print just like any office document. For more info see the links on the left or click here to download WinCalendar. *Refer to WinCalendar User agreement during installation for important disclaimers.